Despite WordPress assigning this post as p1155, this is in fact the 737th post! Yes, it's time for another one of our favourite Useless Rubenerd Blog milestones! I thought I'd celebrate this useless post by espousing some facts on the Boeing 737 which, ironically, has the same family model number as this post. 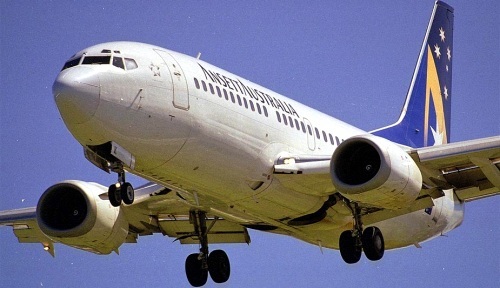 The 737 is the greatest selling aircraft family of all time; placing the value of the design even higher than the revenues from Jim Kloss Domestic Airways before he sold out to Alaska Air. Wondered how he managed to buy all that land and audio equipment? Now you know! Wikipedia claims that since 1967 there have been over 7,800 ordered and over 5,600 delivered (as of 2008), there are over 1,250 of the type airborne at any given time and on average a 737 departs or lands somewhere every five seconds. Unlike virtually any other modern jetliners, the landing gear in the 737 aren't covered by any doors, they retract into special wells and become flush with the fuselage. The turbofans are also weird in that they're not circular or elliptical, but almost a rounded triangle shape! This was due to the fact that the earlier generation 737's from the 1960s used long, thin turbojets wheras the more modern airframes use CFM56's turbofans which are shorter and much wider, and therefore require a hell of a lot more ground clearance! The cockpit section (at least externally) is close to identical to the Boeing 727 trijet and the 707, America's first and the world's earliest commercially successful jet airliner from 1958! These three designs also share the same fuselage width, and their use of tires on the landing gear and doors to enter and exit the aircraft. More than you ever thought you needed to know, or wanted to know I'm sure. What can I say, I'm a guy with a lot of varying, unrelated and highly unnecessary interests! 737 flying over Adelaide :). Taken by David Morrell. The black building right in the background in the CBD is where my office at Oracle was. It really is a beautiful city.